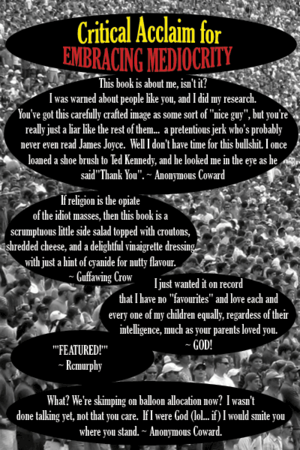 A self help book for losers like you. in which case you're probably not reading this now. You're fat, you're pushing forty, and faced with the realization that the boy who once dreamed of becoming an astronaut is no more. A man has taken his place, and rather than sitting in the cockpit of a capsule, awaiting the thrust of booster rockets that will wrestle him from the grasp of Earth's gravity, he's instead wrestling in the tight grip of an armchair that once fit comfortably, many beers ago. It's nothing to be embarrassed about. It happens to everyone. Yes, farting too, but also the understanding that you've achieved as much in life as you're going to, and are now on the cusp of a great journey along the Plateau of Irrelevance, before that long, slow descent down the Mortal Coil of Utter Obscurity, until reaching your eventual destination six feet below ground where you can find real use in a task ideally suited to your overstuffed cheese-doodle-nurtured carcass—as nutritious food for a variety of underground creatures, and rich fertilizer for the grass that your loved ones would have been weeping on... had you not been a complete nincompoop and alienated them with your self-absorbed hermit-like isolationist tendencies. Of course, all this assumes that some other human being actually deemed you worthy of their hand in marriage. Or, failing that, in the very least selected you as the lucky recipient of three-and-a-half minutes of semi-unbridled carnal enjoyment behind the supermarket dumpster—a bit of coital celebration after a successful diving expedition to liberate day-old doughnuts from their steely prison. However poorly you fared in the game of life, remember, everyone—even truly worthy people who managed to achieve something significant in life—will have to face this change at some point. If you're reading this without assistance, congratulations. You've achieved something in life! Language is the primary characteristic that separates humankind from lower creatures, like bookies and valet car park attendants. Even lower primates know the odds on betting for those teams that somehow always have a spectacular season, but choke like amateurs in the playoffs. And, if you needed reminding, even a meerkat can drive a 5-speed stick. If you're not reading this, then someone else is obviously reading this for you. Congratulations! You've made a friend, or are at least able to run faster than the person you've duped into this chore. By the way, did you know that you can order free pizza by dialing 9-1-1? Tell your friend to order you one now. I was fully potty trained Before age 11, more-or-less. I finished high school By special order of the Superintendent, because area parents complained that it was “creepy” having a 25 year old sophomore asking their daughters out on dates. I moved out of my parent's home When they agreed I could continue to live rent-free in the garage. I went to college To apply for work as a janitor (rejected). I have been employed for 21 years In 361 different jobs. Average tenure, 3 weeks. I have had meaningful relationships With pets and various unattended roadside livestock. I have enjoyed sexual intimacy Except in Delaware, USA where it was a Class D Criminal Felony per statute 11 Del. C. @777 (1993) . The first step in becoming a fully self-actualized washout, is to accept that you did the best you could with what life gave you. 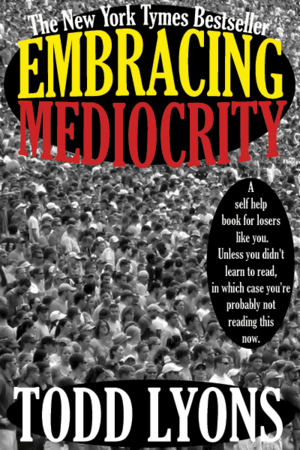 Now, you can settle for taking pride in the things you achieved (and listed in the previous section), or, you can fortify your self-indulgent justification for being a dud by making a list of the people that failed you in life, and describing how their negligence pushed you along the path to becoming a complete flop. Mom Breastfeeding me until I was 12, but not telling me that I shouldn't mention that outside of the house unless I really wanted to be exiled from even the lowest social circles of untouchables as some kind of freak. Dad For enrolling me in boy's baseball despite never having ever played “catch” with me in the backyard, or even watching it with me on TV, but somehow expecting that I'd be good at it despite never showing a hint of athletic ability, and for regularly berating me about how much of a disappointment I was. Mrs. Brown For making me repeat the 3rd grade twice, just because I had religious beliefs that forbid the practice of homework and certain other subjects, specifically math, and for failing me in all subjects including “Recess” and “Show and Tell”. Mr. Jenkins For firing me from my after-school job at the corner store just because I had a bit of a sweet tooth and ate a few dozen boxes of inventory, and forgot to show up for work for a few weeks once, and used to shoot three-pointers down ladies blouses with gumballs, and made a house of china plates because I forgot which aisle the playing cards were in—how was I supposed to know that door would swing open that wide? Mr. Smith For his anger at me ratting out precisely where he touched me. The possibilities are endless. Chances are, if you think hard enough, just about everyone you've ever met has contributed to your downfall in some way. List them all. And, if you've got the time, rank them in order of how much they upset you. Then, use Google to find out where they're living nowadays and pay them each a personal visit. They'll probably apologize if you explain it to them convincingly. This should be self evident; you've probably already been doing it for years because of the unexplained 30-year drought you've been experiencing, date-wise. Self-love is something that is generally mastered by most all young boys before the age of 5. Should you require additional information on techniques, turn to the experts. Seeing as Dr. Ruth Westheimer has you on her “Not Allowed On Air” list, check and see if any of the local Community Access TV channels or radio stations have their own call-in shows. If they've banned you too, there's always Yahoo Groups. Picsearch.com also has some lovely, educational images you might enjoy. This, the third and final step, establishes your indispensability in the world, despite the job that you do. Feel free to educate people about your essential role in the operation of society, and if they baulk, use your secret powers to extract revenge. Janitor Providing a spotless washroom for your most intimate duty. Cheerfully cleaning and disinfecting every virus-infested surface—except the toilet seat—for the duration of your employment. Garbage Man Keeping neighbourhoods safe of environmental hazards, and free of vermin and other pests. “Accidently deleting” customer addresses, then misfiling subsequent complaint reports and special orders for several months due to “administrative errors”. Fast food cook Feeding the nation's hungry . Getting back at saucy customers by adding your own “special sauce” to their order. Remember, the only real power that you have is the power that you take for yourself. So think about how much influence you have over the lives of others, remind them of it periodically, and punish the non-believers. You too can be at peace with yourself, whether you're the municipal Dog Catcher, or something truly low and unsavoury, like Speaker of the House of Representatives.